Palin called out Reid Wednesday. (CNN) - A spokesman for Senate Majority Leader Harry Reid is hitting back hard at Republican vice presidential candidate Sarah Palin's speech Wednesday night, calling it "shrill and sarcastic." "Anyone who knows Senator Reid knows he never backs down when he's fighting for what's right and that he always stands up to John McCain when he is wrong," Jim Manley, Reid's press secretary, told CNN. "Shrill and sarcastic political attacks may fire up the Republican base, but they don't change the fact that a McCain-Palin administration would mean four more years of failed bush-Cheney policies." The reaction came after Palin specifically called out Reid during her address to the Republican National Convention, saying the Nevada Democrat "can't stand up to John McCain." "Harry Reid, the Majority Leader of the current do-nothing Senate, not long ago summed up his feelings about our nominee. 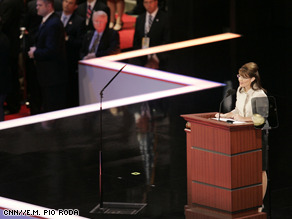 He said, quote, 'I can't stand John McCain,'" Palin said to roaring applause from the crowd. "Clearly what the Majority Leader was driving at is that he can't stand up to John McCain." Ha, Sounds like most of you loser Dems are jealous, pathetic goons. Sarah was awesome last night–and had MUCH substance, substance you can't see behind your SnObama-blind eyes. It takes people of substance to recognize it and it's obvious that many of you liberal Dems are scared. McCain has demonstrated his leadership and character in this decision alone–much less his actual service to the country. Your pathetic ticket has demonstrated nothing but service to self–I surmise a trait you all admire since it's like looking in the mirror. So a spineless mouth for the spineless nv senator calls the Woman of Steel shrill and sarcastic. Bet neither of the two caballeros ever held a hockey stick or a shotgun in their hands. Patriotisim? How can the Republicans talk about patriotism? Now I read that their vice-presidential cnadidate ahs a history of supporting votes for her state to leave the Union! To renounce it's status as part of the United States of America! Anyone ever hear of Arron Burr? That is the ultimate insult to our country, enarly, if not, an act of treason. How in the world can the GOP embrace her as a patriotic American and anyone fit to be second in command of our United States of America. Don't talk to me about flag pins, or being proud of out country. Talk to me about at elast wanting to be a part of our country. day seven: write her a pitbullspeech attacking her opponent.. So, Harry Reid is hopping mad, and is fighting back? Something that never occurs to him if it's America's enemies, foreign and domestic. How about a Senate Resolution condemning "shrillness" against Liberal hauteur and revisionism? Another chance for Obama to vote "PRESENT," his trademark record of "leadership!" It's easy for anybody to "talk tough" when reading a "ready made" speech from a teleprompter. Come now Chi, Obama is an inarticulate baffoon without his teleprompter, and ALL speeches are "ready made"... if you believe Hussein is speaking off-the-cuff, you are brain-washed. Obama doesn't talk tough because he is Anti-American and Hopes to see his country Change for the worse. Four years of Obama will result in the fall of America, and the rise of China and Russia. Obama is a COWARD unable to stand up to the challenges of our times. THERE IS NO OPTION OF VOTING PRESENT IN THE WHITE HOUSE HUSSEIN. HOMERUN PALIN!!!! NOW WE KNOW WHAT THE O IN OBAMA STANDS FOR. A ZERO!!!!! We need to careful describing this canidate from the right and the republicans. Education, morality and hardwork are compromised by the right whenever they see fit with reference to the contrast of the canidates. Palin reminds of a cheerleader praising John McCain and that is not bringing her down because I have respect for women. But thats why she was choosen by the republican party. Women rise up. going to take any crap from neither party! SHE MAKES WOMEN LOOK PROUD! Anger, bitter, and sarcastic. I am tired of these qualities in politicians. People need to look into her record. It's small and unimpressive. Oh, she's a b-. Is that what we want in the White House? Okay, instead of shrill how about strident or simply annoying. Take your pick. Astrid, I'd like you to tell me who created the mess in Washington. Democrats have had a slim majority in Congress for the last two years. But what about the Bush administration and all those years of Republican congressional dominance? Shrill? Why does that word sound familiar? Oh yes, that's right, that's what they called Hillary as well – 'Shrillary' I think it was. Any successful woman is going to be called shrill by those who oppose her, it's a code word that is never used on male politicians. It's disappointing that this term was used. Yes, women's voices aren't as deep as men's – it's a biologicial fact, but I'm tired of every female politician being called shrill by her political opponents. That isn't the way to win over undecided Hillary supporters, many of which are women. So, Sarah Palin describes herself as a "hockey mom". Does she mean "hockey" as in the sport of, or is she refering to the horse variety? There is no way this person could be in the White House, why would we let a Pit-Bull run loose in the White-House. This was more like a stand-up routin by the lady from the Fargo movie than a appeal to people to vote for McLeash. All that was missing was the standard line "try the veal I'll be here all week". I could see Putin now calling McCain and saying to him, "you better put a muzzle on the female dog before I do." Or her barking out her material for Kim Yong-nam and friends as he looks to step over her mouth and bottom droppings on the White-House lawn. She can only pray that her schedule only permits for speeches and not intervews. But I must say it would be nice to have a dog as VP...she might even get the PETA vote. Bark Bark Bark!!!!!!! The only ting that Palin has governed is polar bears and penguins. And that's real leadership? Give us all a break!!! Now I can see why the Democrats and their liberal allies in the media are busting a gut to smear Sarah Palin and her family. They are scared stiff at the impact this woman will have on the stump. She's a winner! Palin e-mails show intense interest in trooper. This woman is such a phony, and the republicans, as always, are eating her up. The last thing to call a woman is shrill, this is the first line insult of small minds that are in the habit of automatically denigrating any woman. No one ever refers to a man as being "shrill", I would think these career politicians like Reid would at least know that by now. Just that comment alone lets me know he is really out of touch with how to communicate with women voters. I need to thank Palin for helping me understand some things. I was unaware that authoring more than 800 pieces of legislation and cosponsoring over 1000 more during his time in both the state and US senate means that Obama has penned two memoirs but never any major bill. I guess The Coburn-Obama Government Transparency Act of 2006, The Lugar-Obama Nuclear Non-proliferation and Conventional Weapons Threat Reduction Act, and The 2007 Government Ethics Bill are small potatos to someone of Palin's qualifications. I've also learned that volunteering is apparently a bad thing. Little did I know that someone who does such a selfless act of working for free for a cause they believe in means it's a direct comparison to an elected position where you abuse your power by inquiring how to ban books. I now know that there's no reason anyone should volunteer in places like a soup kitchen, or as a community organizer helping youth and the jobless, or the local McCain/Palin headquarters near Columbus, OH. If I were to run for office in the future, I wouldn't want such a negative thing as volunteering to come up during speeches! As a political junky and have followed politics for years, I must say that the pick of Palin is odd. The TURE reason, I think, is that NO one else would run with John McWAR. So they had to find the only one who whould say yes. I too aggree with most comments on here, that that speech was just crap and had no meat as to what the Repubs plan or vision is for the future. So it must be true that it will be 4 more years of the FAILED bush/shoot you in the face cheny! I will take my chances with Mr. Obama.